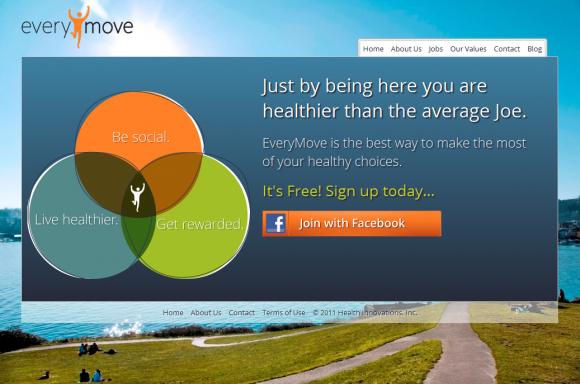 TechStars alum EveryMove (@EveryMove) has closed a $2.6 million Series A round to continue development of a healthy rewards platform they call a “mileage plan for health benefits”. The round included Premera Blue Cross, Blue Cross Blue Shield of Nebraska, Blue Cross Blue Shield Venture Partners (managed by Sandbox Industries), Founder’s Co-op, Summit Capital, as well as angel investors Jonathan Spesato, Geoff Entress, Matt Shobe, William Lohse, Andy Liu, Ken Kuntz, and others. EveryMove’s platform enables insurance companies, employers and brands to provide incentives and rewards based on individual’s healthy life choices. Average annual premiums for family coverage through an employer reached $15,073 in 2011, up 9 percent over the previous year according to a study by the Kaiser Family Foundation. Most expect this growth rate to continue, taking up a larger share of household budgets every year as income growth fails to keep pace with premiums. The service connects people through their lifestyle style actions, which are captured through the passive collection of data generated by various health and social applications. For example, use Foursquare to check-in at the gym and you earn points. If you record your morning run using RunKeeper, you earn more points. This is a powerful model for determining rewards, particularly the fact that it appears to be totally passive in nature, leaving consumers to go about their typical routine without any additional pressure or burden of a service to update all day manually. “It is time to make room at the table for consumers to be part of the conversation around their health. Technology is enabling consumers to more easily demonstrate the value of their lifestyle activities and that is empowering. At EveryMove, individuals will have an opportunity to turn their lifestyle activities into real value for their actions. With this funding, we bring together significant strategic partners in support of our efforts,” said EveryMove’s Co-founder and CEO Russell Benaroya in a press release. “The healthcare industry is recognizing that the future is in how we engage with and empower consumers to impact overall health costs,” he added. EveryMove will certainly have no shortage of competition in this space, with several new healthy incentive startups launching recently, but their partnerships with Blue Cross at an early stage gives them an early leg up on the competitors. Adding Chicago-based Sandbox Industries to their list of investors in the latest round also brings one of the leading digital health venture capital firms to the table. “We are thrilled to be working with the EveryMove team to build a market-leading incentives and rewards platform for consumers who are making healthy decisions. They have the capabilities and strategic alignment to achieve this vision and in turn help health plans create new and exciting products for the future generation of healthcare consumers,” said Anna Haghgooie, Managing Director of Sandbox Industries, the fund manager of BCBS Venture Partners. In a great post on his personal blog, co-founder Marcelo Calbucci explained how important and lucky is was for them to land Sandbox as a strategic partner/investor. In the same post, Calbucci also gave a very well articulated explanation of EveryMove’s philosophy and why a service such as their’s is so vital for there to be meaningful changes to the health care system. In the age of the accountable care organization, it seems perfectly logical to me that individuals should also be held accountable for living healthier lifestyles, and rewarded/penalized accordingly. Lets not forget the ongoing and accelerating obesity epidemic, which is surging past 20 percent in nearly every state of the country. We should be doing everything we can to fight this major public health crisis and no better way, in my opinion, than to make those who are living unhealthy lifestyles pay for it. The company will monetize the platform on a cost-per-action basis by taking a fee when users redeem rewards or incentives from their plan, brands or employer. The video below is the company’s TechStar’s pitch.